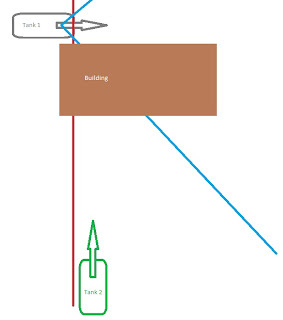 Another issue that has come up that further makes me a proponent of the 90 degree arc, is a concealed tank where the front of the tank is hidden. 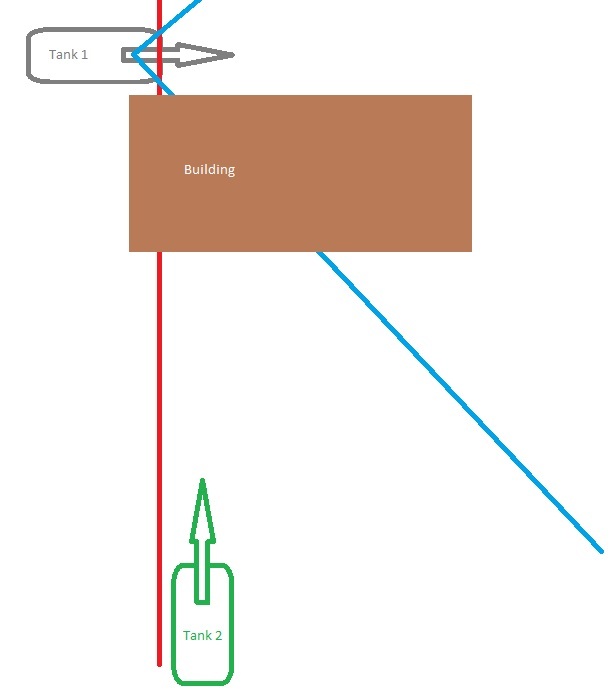 The rules state that if more then half the tank is hidden, but the main part is still visible the tank gets concealment. 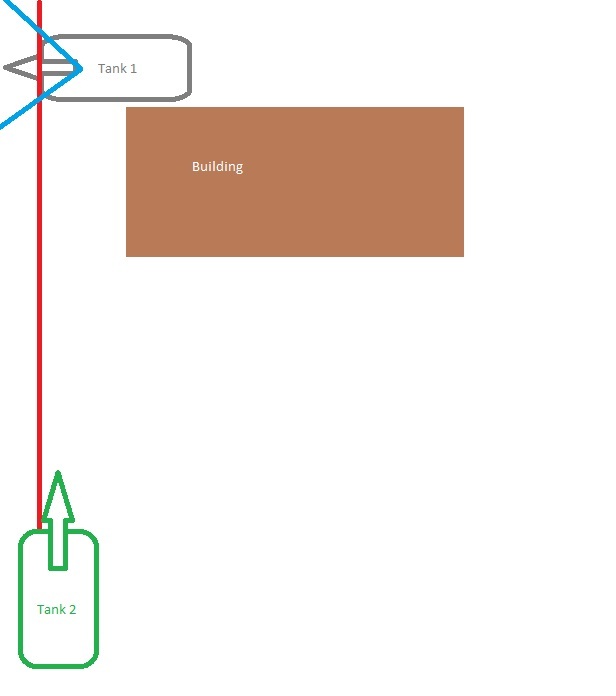 So, basically if 50% to 90% of the tank is hidden the tank gets concealment. The issue now arises if its the front part of the tank is hidden. By the current rules HAS to shoot at the front armor. Which is totally ridiculous. Sorry for the juvenile picture, but the picture shows where Tank 1 has concealment form tank 2 but tank to can't see the front of the tank. Because he is still in front of the 180 degree line he would still have to shoot at front armor. Never mind like I've discussed before, that even if that building isn't there, you can still barley see the front of the tank. Conversely, in this next picture you can see way more of the front of the tank, but yet now you would get to shoot at the side armor of the tank. Forgetting that I don't like the 180 arc, but the current rules in this situation you shoot at the side armor and not the front even though you can see more of the front armor then the picture above. With my 90 degree arc rules, this strange situation can never happen. 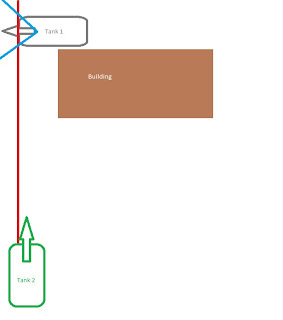 If you are straddling the front armor line like these 2 pictures, and there is a building in the way, you mostly likely won't even be able to shoot at the tank. If you can it would clearly be a front armor, or side armor shot. I think I may have found why people aren't seeing this. In forum posts on the FoW site it seems a lot of people are either still playing the old way where you have to turn your turret to shoot. Or some misinterpretation where you can only turn your hull if you are firing a hull MG. Otherwise the turret still has to turn. You can't say one vehicle can turn if it doesn't fire its hull MG, but just because you want to force a turret to turn with a rule, say that another vehicle can't turn hits hull if it doesn't have or fire a hull MG. That would just be silly. The 90 degree arc gives a choice, and makes it worth while for a turret to turn. I don't believe this was Phils intent with the rule change, anyway. It wouldn't make any sense. To keep things in line with things being simple, the hull and turret turn together (just like hull mounted) at the closest team. I think maybe once people start playing this way and see they might as well Glue their turrets down...maybe this will catch on. The more situation I run into, and the more people talk about it, the more I think this is a must. There was even one topic were guys were having trouble dealing with Panthers and Konigstigers. Its just so hard to get behind that 180 line. There is nothing in the game that can penetrate the front armor of a king tiger. Sure, you could use planes or engineers to take them out. But put in the 90 degree arc, and you force those big cats to play smart. Its just to easy to keep everything in front of that 180 degree line. And as you can see with front armor, it just makes no sense. I know this game has never claimed to be 'realistic' and I'm OK with that. but having a rule just because its simple doesn't make it right. I think this is the one that that is hold this already GREAT game from turning into a Legendary game. What makes this situation even worse, is if tank 1 is a gun team with a gun shield. It makes no sense, but you would still have to make a fire power check for shooting at the gun shield. Even though there is no way the gun shield could protect them from that angle, never mind also being behind the building. Next step is to develop an easy way of measuring the 90 degree arc. Maybe some sort of custom laser projector? wouldn't that be sweet? I think it's just a filter. I wonder if we could build one. even one that just shines an "X" instead of a line. then you have your 90 degree arc. I fully agree that Flames needs that 90 degree arc. we ran into the exact situation you show in your first picture, a Sherman clearly had a shot on my tiger but due to the way the tiger was sitting in a village the front of the tank was hidden yet the Sherman still had to hit front armor. now to cut Phil some slack as well I can see it his way as well (sort of). if your hitting the side armor at that kind of angle realistically I would expect it to glance off but if it did penetrate you are now doing so at a fairly extreme angle and thus trying to penetrate a thicker expanse of armor plate. basically its the same effect as sloped armor giving the effect of thicker armor without being so thick. I can only assume this is the reasoning Phil has but I still think the arc (or lack there of) FOW uses needs to be changed. I'm going to my first tournament this weekend with KT's. If I get killed from a side armor shot, I will be totally embarrassed. For measuring right angles, all you need is an artillery template - just use use a corner (frankly, you can use a piece of paper). Once you have that line, if there's argument, you can extend it with a tape measure. A laser pointer is nice, certainly, but not necessary. I'm fine with a 180-degree armor arc on the turret, since my guess is the thicker armor on the turrent extended more around the rounded sides (ie, along the front 180-degrees of the turret), rather than only being on one side of the rectangular hull.